Yesterday when I was running on treadmill I let my mind wander how all this data that is generated in the equipment could be used to improve my exercise, services offered and the overall wellbeing of everyone involved. The data from the equipment and scales should be sent to a server where I can access it. I would be able to track my progress set goals and share my achievements with friends. Posting to Twitter and Facebook will make my experience more social and I would be less likely to quit exercising. A special Facebook application can handle the competition with other member of the club. This will tie the users to the brand’s fan page and application on Facebook. On the other hand the owners of the fitness club could get incredibly valuable data about how people behave, what are the motivating circumstances and what patterns indicate that somebody is going to quit. This will enable them to customize their offers to meet the individual needs of each client. In the end people would exercise more, socialize more, be more healthy and happy. I would really, really love this in my gym. The overall happiness index would go up a few notches. 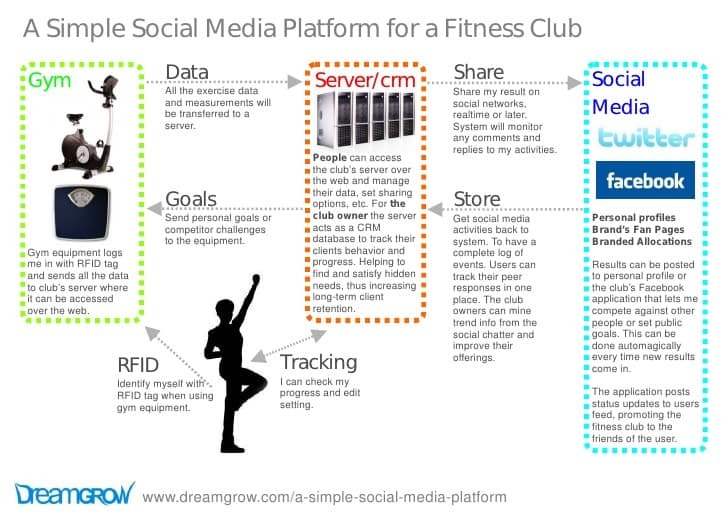 Of course, this platform could be used for other things than just fitness club, but it’s a good example. Here is a picture to get a better understanding how this should work.